A Fine German late 19th Century Berlin (K.P.M.) 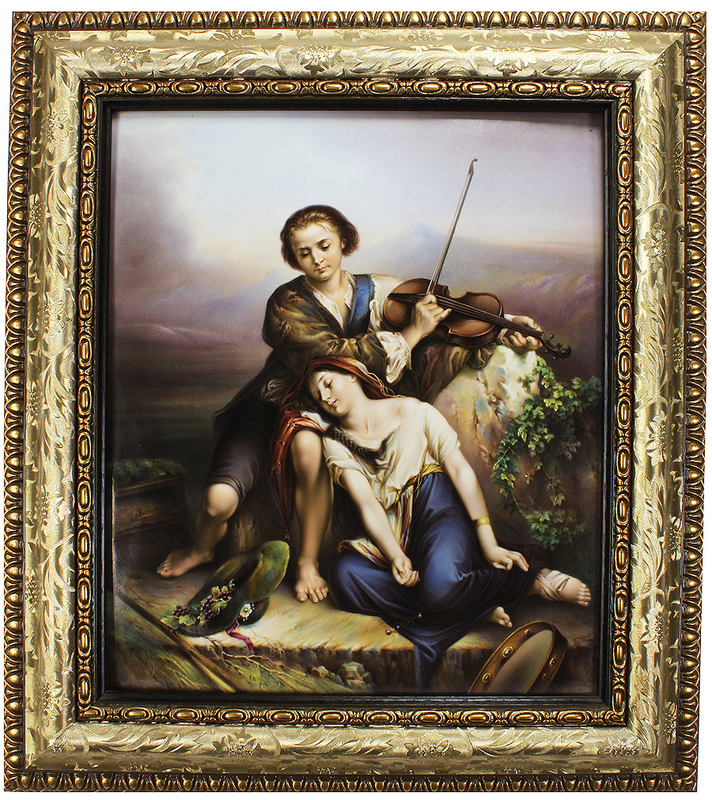 Porcelain Plaque "The Recital". 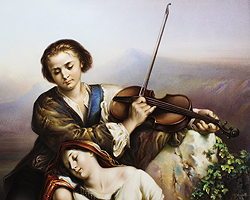 The finely painted rectangular plaque depicting an outdoor scene of a young man playing the violin before a rocky ledge, a sleeping maiden with a hat full of grapes at his feet, a tambourine in the foreground. Impressed KPM monogram and sceptre mark on the reverse, withing a gilt wood carved frame. The Berlin Porcelain Factory: The present factory of Berlin was founded in 1761 by Johann Ernst Gotzkowsky, who picked up the pieces of the factory of Wilhelm Casper Wegely, who went broke in 1757. In fact the making of porcelain in Berlin started in 1751 when Wegely, a wool-manufacturer, obtained a licence to set up a factory. With the help of many workers of the Meissen and Höchst factories (also the necessary kaolin and a model of a kiln was supplied), Wegely was able to produce porcelain but the quality was not of a high standard. The business was not very succesful with the result that Wegely had to close the factory due to financial problems. 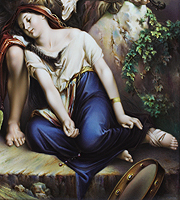 During its existance, Heinrich Reichard was the master-modeller and Isaak Jacob Clauce the painter. Wares of the Wegely factory were marked with the initial W, this always in combination with numbers. During the next four years, no porcelain was produced in Berlin. In 1761 it was Gotzkowsky, a merchant with great expectations, who bought the 'arcanum' from the Wegely-modeller Reichard. He also secured himself of the collaboration of the Wegely-painter Clauce and furthermore he bought the remaining stock of the Wegely factory as well. In order to improve the quality of the manufactured porcelain, Gotzkowsky hired a lot of experienced craftsmen from the Meissen factory. Amongst them the modeller Friedrich Elias Meyer and the painters Karl Wilhelm Böhme, Johann Balthasar Borrmann and Karl Jakob Christian Klipfel. The quality of the wares did increase enormously, but the cost was increased as well... After only being two years in operation, the new established factory did already employ ca. 150 people. As the market was rather small (only the very rich could affort to buy porcelain), also Gotzkowsky was overtaken by financial difficulties and was forced to sell the factory to Frederick the Great in 1763. Frederick the Great took vigorous steps to promote his factory, with the result that during the rococo period Berlin became the leading German factory for making porcelain dinner-services. Also the figure-modelling of the brothers Meyer was outstanding and Berlin flower-painting (so called Deutsche Blümen) became an example to a lot of other factories. Like many other porcelain factories, the Berlin factory did have its ups and downs, but it always managed to survive the difficult periods. Nowerdays it is still one of the leading porcelain manufacturers of Germany, Europe and the world. Concerning the marks used at the Berlin factory after the 're-opening' by Gotzkowsky, we can say the following: * From 1761 till 1763, when Gotzkowsky was in command, the porcelain was marked with the initial 'G' in blue under glaze. * From 1763 till 1837, the porcelain was marked with the scepter mark in blue under glaze. The scepter mark was introduced when Frederick the Great bought the factory. In this period the scepter was depicted with a horizontal bar. * From 1837 till 1844, the initials 'KPM' were added tot the scepter mark (KPM was standing for Königliche Porzellan Manufaktur'). * From 1844 till 1847, the scepter in the above described mark was replaced by an eagle, holding a scepter and a globe. Be aware for objects offered with this type of mark as it is recently used by an unknown factory, producing porcelain, which is poor modelled and decorated ! * From 1847 till 1870, a circular 'seal' was used for marking purposes. It depicted the eagle as already described and surrounded by 'KOENIGL. PORZELLAN MANUFAKTUR' * As from 1870 the scepter mark was re-introduced, but now with a diagonal bar in stead of the earlier horizontal one. * Furthermore, between 1882 and 1918, a special type of porcelain was developed by Seger. Wares made of this porcelain were marked with the scepter mark with the initials 'S.gr.P' (Seger-porzellan). At the end of the second world war, the factory of Berlin was partly destroyed. During the rebuilding, the production was temporarly moved to a factory located in Selb. The production during this period was marked with the scepter mark with the initial 'S' added. 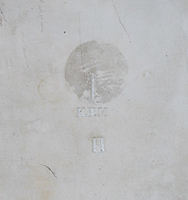 In addition to the factory mark, and this for wares which were decorated by painters employed by the Berlin factory, a 'decoration' mark was applied as from the 19th century. These were stamped in blue, red or green on the glaze and were depicting or an scepter, an eagle or a globe. A Fine German late 19th Century Berlin (K.P.M.) 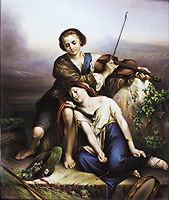 Porcelain Plaque "The Recital". 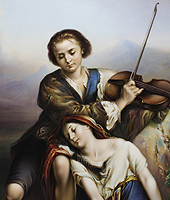 The finely painted rectangular plaque depicting an outdoor scene of a young man playing the violin before a rocky ledge, a sleeping maiden with a hat full of grapes at his feet, a tambourine in the foreground. Impressed KPM monogram and sceptre mark on the reverse, withing a gilt wood carved frame. The present factory of Berlin was founded in 1761 by Johann Ernst Gotzkowsky, who picked up the pieces of the factory of Wilhelm Casper Wegely, who went broke in 1757. In fact the making of porcelain in Berlin started in 1751 when Wegely, a wool-manufacturer, obtained a licence to set up a factory. With the help of many workers of the Meissen and Höchst factories (also the necessary kaolin and a model of a kiln was supplied), Wegely was able to produce porcelain but the quality was not of a high standard. The business was not very succesful with the result that Wegely had to close the factory due to financial problems. 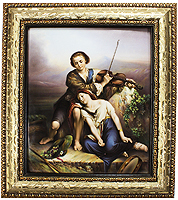 During its existance, Heinrich Reichard was the master-modeller and Isaak Jacob Clauce the painter. Wares of the Wegely factory were marked with the initial W, this always in combination with numbers. During the next four years, no porcelain was produced in Berlin. In 1761 it was Gotzkowsky, a merchant with great expectations, who bought the 'arcanum' from the Wegely-modeller Reichard. He also secured himself of the collaboration of the Wegely-painter Clauce and furthermore he bought the remaining stock of the Wegely factory as well. In order to improve the quality of the manufactured porcelain, Gotzkowsky hired a lot of experienced craftsmen from the Meissen factory. Amongst them the modeller Friedrich Elias Meyer and the painters Karl Wilhelm Böhme, Johann Balthasar Borrmann and Karl Jakob Christian Klipfel. The quality of the wares did increase enormously, but the cost was increased as well... After only being two years in operation, the new established factory did already employ ca. 150 people. As the market was rather small (only the very rich could affort to buy porcelain), also Gotzkowsky was overtaken by financial difficulties and was forced to sell the factory to Frederick the Great in 1763. Frederick the Great took vigorous steps to promote his factory, with the result that during the rococo period Berlin became the leading German factory for making porcelain dinner-services. 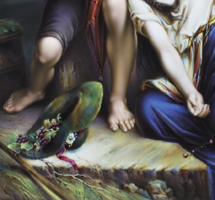 Also the figure-modelling of the brothers Meyer was outstanding and Berlin flower-painting (so called Deutsche Blümen) became an example to a lot of other factories. Like many other porcelain factories, the Berlin factory did have its ups and downs, but it always managed to survive the difficult periods. Nowerdays it is still one of the leading porcelain manufacturers of Germany, Europe and the world. * From 1761 till 1763, when Gotzkowsky was in command, the porcelain was marked with the initial 'G' in blue under glaze. * From 1763 till 1837, the porcelain was marked with the scepter mark in blue under glaze. The scepter mark was introduced when Frederick the Great bought the factory. In this period the scepter was depicted with a horizontal bar. * From 1837 till 1844, the initials 'KPM' were added tot the scepter mark (KPM was standing for Königliche Porzellan Manufaktur'). * From 1844 till 1847, the scepter in the above described mark was replaced by an eagle, holding a scepter and a globe. Be aware for objects offered with this type of mark as it is recently used by an unknown factory, producing porcelain, which is poor modelled and decorated ! * As from 1870 the scepter mark was re-introduced, but now with a diagonal bar in stead of the earlier horizontal one. * Furthermore, between 1882 and 1918, a special type of porcelain was developed by Seger. Wares made of this porcelain were marked with the scepter mark with the initials 'S.gr.P' (Seger-porzellan). At the end of the second world war, the factory of Berlin was partly destroyed. During the rebuilding, the production was temporarly moved to a factory located in Selb. The production during this period was marked with the scepter mark with the initial 'S' added. 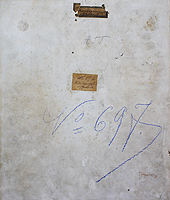 In addition to the factory mark, and this for wares which were decorated by painters employed by the Berlin factory, a 'decoration' mark was applied as from the 19th century. These were stamped in blue, red or green on the glaze and were depicting or an scepter, an eagle or a globe.